The City is undertaking a Traffic Management and Mitigation Study within the Leslieville Community. The objective of this study is to identify the key congestion areas and propose innovative short and long-term projects to mitigate transportation issues. The first of two Public Open Houses took place on Wednesday July 18, 2018 at Morse Street Junior Public School. Information presented included existing traffic conditions, alternatives being considered and mitigation measures. The second meeting will be scheduled later in the fall of 2018, to present alternative solutions for discussion and feedback. The City of Toronto launched a Traffic Management and Mitigation Study within the Leslieville Community. This community is in transition as there are numerous applications for redevelopment, mainly mixed use. Two Public Open Houses will be held to present the study, illustrate current and future traffic conditions, and proposed mitigation measures. View Notice of Study Commencement. 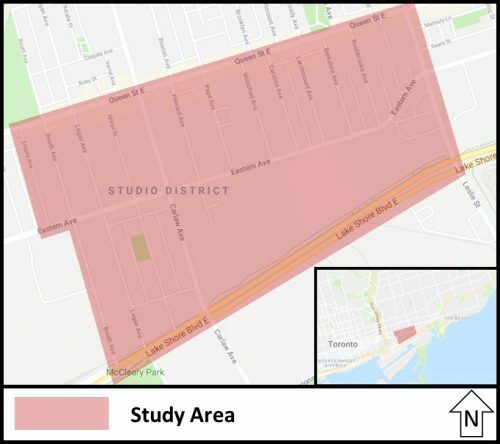 The study area is defined as Queen Street East to the north, Leslie Street to the east, Lake Shore Boulevard East to the south and McGee Street (Booth Avenue south of Eastern Avenue) to the west. “City Council request the Director, Transportation Services, Toronto and East York District, in co-operation with the Director, Community Planning, Toronto and East York District to continue to work with the Traffic Working Group for 629, 633, and 675 Eastern Avenue to develop a Traffic Management Mitigation Plan…” View Agenda Item. There are a variety of methods for the public to participate in the development of the Traffic Management and Mitigation Study. Contact the Project Team and attend the two Public Open Houses. The meeting will be an open house format with a formal presentation at 6 p.m. Information presented will include existing traffic conditions, alternatives being considered and mitigation measures. The second meeting will be scheduled later in the fall of 2018, to present alternative solutions for discussion and feedback.